The All-in-One Contactless, Chip, and Swipe Card Reader. 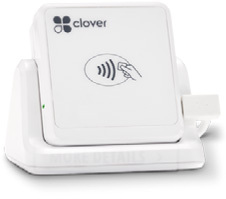 So whether you’re running around your store or tend to take matters into the field, Clover® Go Contactless Reader is your go-to POS for secure credit card swipes, dips and taps like Apple Pay®, Samsung Pay™ and Android Pay™. It also offers many of the same industrial strength payment capabilities and the security as our larger Clover devices. Just provide your own smartphone or tablet and a free hand. No matter how your customer is paying — EMV® chip, swipe, or with their mobile device, Clover Go can take it. This tiny device is packed with possibility. With the Clover Go solution you get intuitive reporting on sales activity, business insights and more.